Today, for the millionth time someone sent me a link to yet another usb flash drive perversion. Links to usb flash drives made out of weird items seems to facinate blog-reading geeks endlessly. I’ve identified some trends, and I think I came up with an ultimate product that will make all the bloggers absolutely cream their pants. 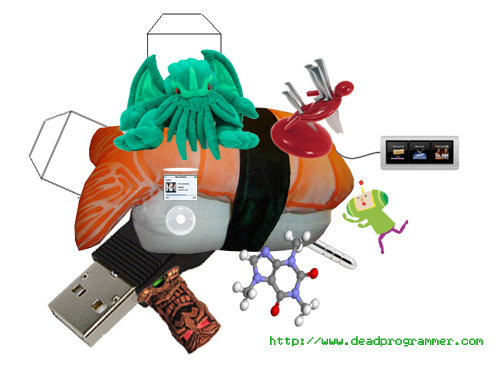 Prepare yourselves, iiiiiiiiitt’s the caffeinated open source papercraft usb powered thumbdrive plushy cthulhu katamari sushi tiki ipod cozy voodoo knife holder marital aid with oled keyboard. Did I forget anything?